Spray muffin pan with nonstick cooking spray (2 1/2- inch; 12 count). 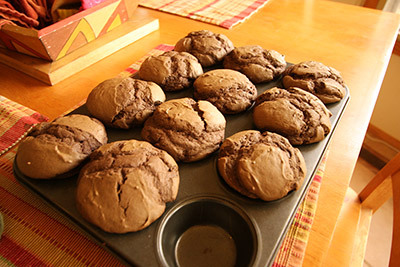 In a medium bowl, stir together flour, baking powder, salt, cocoa powder and sugar; set aside. Measure bran cereal and milk into large mixing bowl; stir to combine. Let stand 5 minutes or until cereal has softened. Add egg whites and oil; beat well. Stir in banana slices. Add dry mixture, stirring until combined. Pour batter evenly into muffin pan cups. Bake for about 25 minutes or until muffins are lightly browned. Serve warm.